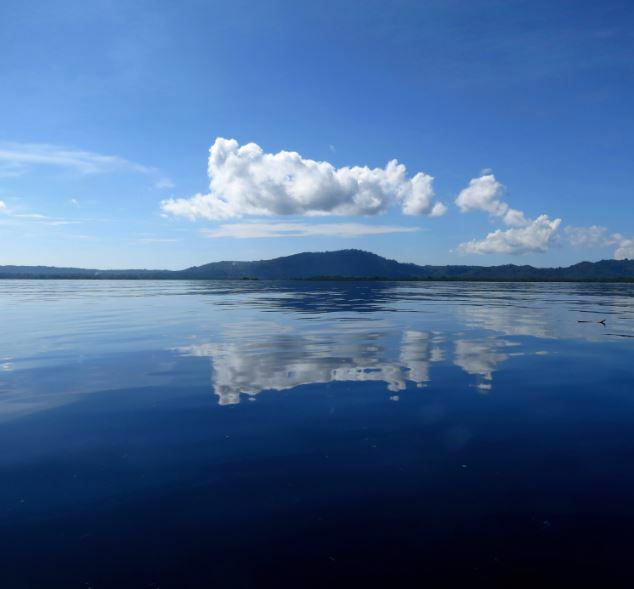 Murex Monthly Marine Life Feature – Taking a Spin to Bangka! This week guests at Murex Dive Resort Manado have been experiencing amazing dolphin encounters along the coast of the Manado mainland. Imagine cruising over millpond still, crystal clear water, relaxing with a coffee whilst anticipating the first dive of the day when the boat crew leap up and yell “DOLPHINS!! … DOLPHINS!!! …. DOLPHINS!!! 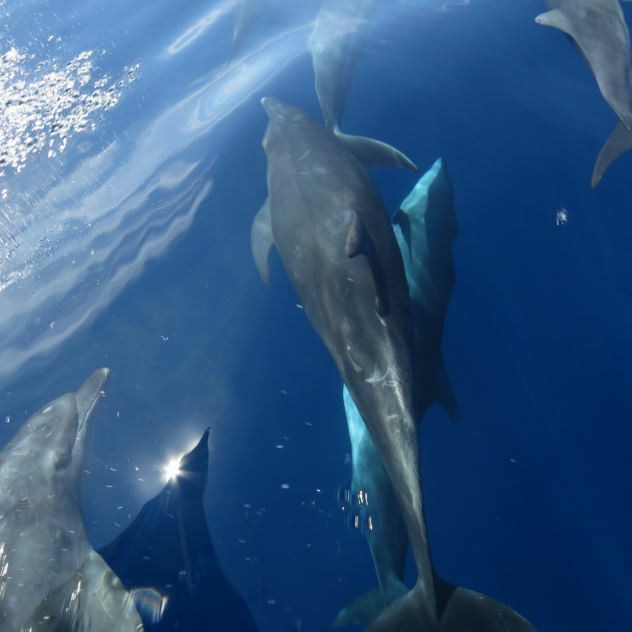 !” And they didn’t mean just a handful of dolphins – a pod of around 50 – 100 loomed up ahead, there sleek bodies lazily arching out of the water for us to see. The boat captain cut the engines to a slower pace as we cruised up towards the pod. As the boat drew near the dolphins they became alert to our presence and to our guests delight they wanted to play! After a few initial and cautious jumps and leaps they began bounding along in the wake of the boat and within seconds they had caught us up and were ducking and diving alongside the bow. In the crystal clear waters of the Manado coastline we could see everyone one of their features; eyes, snouts, even the scratches a few of them bore along dorsal fins. The dolphins kept pace with us and seeing how much pleasure this was giving the guests we turned the boat around and circled to maximise our time with the pod. What a memory for all on board! At last though the time came when we had to push on to our first dive site. The captain slowly increased the speed and we pulled away, once we were clear we opened the engines back up and as we looked behind we were astonished to see the dolphins leaping clear out of the water and spinning in our wake – Good bye Murex team and see you next time! The spinner dolphin (Stenella longirostris) is named after its acrobatic displays in which it spins along its longitudinal axis whilst leaping through the air. Spinner dolphins are a small species of dolphin (unlike the larger bottlenose) and a fully grown adult measures between 129 – 235cm long and weighs between 23 – 79kg. Spinners are nocturnal hunters and they feed on a mixture of small fish, squids and shrimps and will dive up to 200 – 300 meters to find food! Spinner dolphins have a 10 month gestation period and mothers nurse their young for one to two years. Spinner dolphins cannot shut down their brains when they sleep as they would drown, they maintain some brain function and swim in long slow u- patterns which periodically bring them up to the surface to breath – this is what we usually see during the day time when the dolphins are slowly breaching the surface. Spinners turn off the sonar part of their brains when they sleep so they do not hear any sound – at this time they rely only on their eye sight. The acrobatic displays of the spinners are most frequently seen at sunrise and sunset and it is the pods way of regrouping when they wake up to prepare for the nights hunt and their way of settling down as a group in the morning before they synchronize their breathing and prepare to sleep. A dolphin can make from two to five and a half spins in one leap; the swimming and rotational speed of the dolphin as it spins underwater affects the number of spins it can do while airborne. When spinners are sleeping through the day they tend to inhabit coastal bays (of which there are any around Manado, Bunaken and Bangka), at night time when they hunt they move out to the blue water. Spinner pods can contain as many as 1,000 individuals – and yes, they are well known for riding the bow waves of boats passing by. Whilst these facts are certainly interesting, have a look at the video shot by our guest Alex Chua and some of our trip images – or even better come and see for yourself! Video & header image by : Alex Chua while on a recent trip to Murex Dive Resort with the Sea Hounds from Singapore.